We arrived at the dock from our morning tour with just an hour before the next, so we decided to rest at the terminal end rather than walk to the ship. Ron found some chairs, but I wandered off to a stony scrabby field where I lay on the ground half dozing. Soon the tour busses arrived and we boarded, heading to Wismar. We learned that Wismar was originally Swedish, but they lost the 30 Years War and 2/3rds of the population. The great shipyards produced submarines in WWII in an enormous building, still standing. But the rest of the dockyards were bombed. We followed our tour guide through the town, enjoying the late medieval houses and small canal, and running off quickly to grab a sandwich in a hole-in-the-wall, where English was minimal. We did a lot of pointing and smiling and came away with “Subway” style hoagies. The town is famous for its waterworks, providing clean-ish water to the breweries. 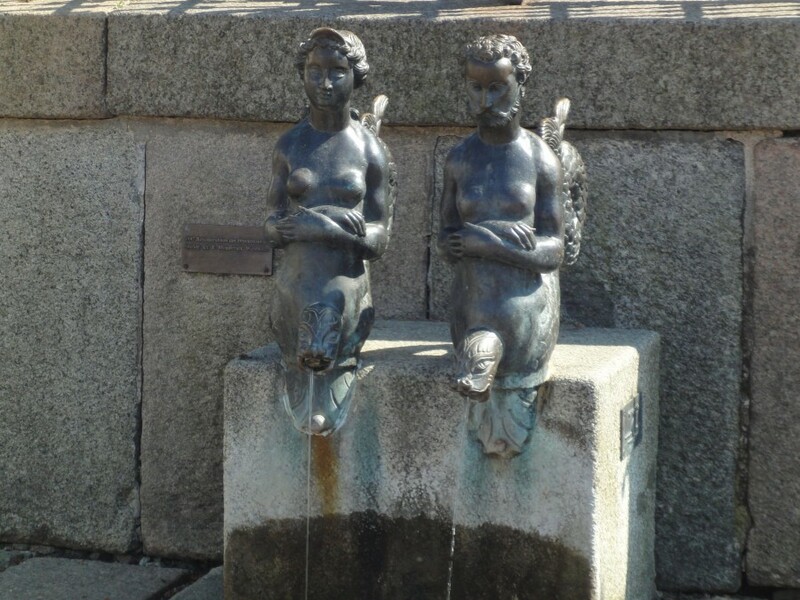 A rather notable pair of mer-persons grace the town square, where the main well is housed in a 19th century pavilion. 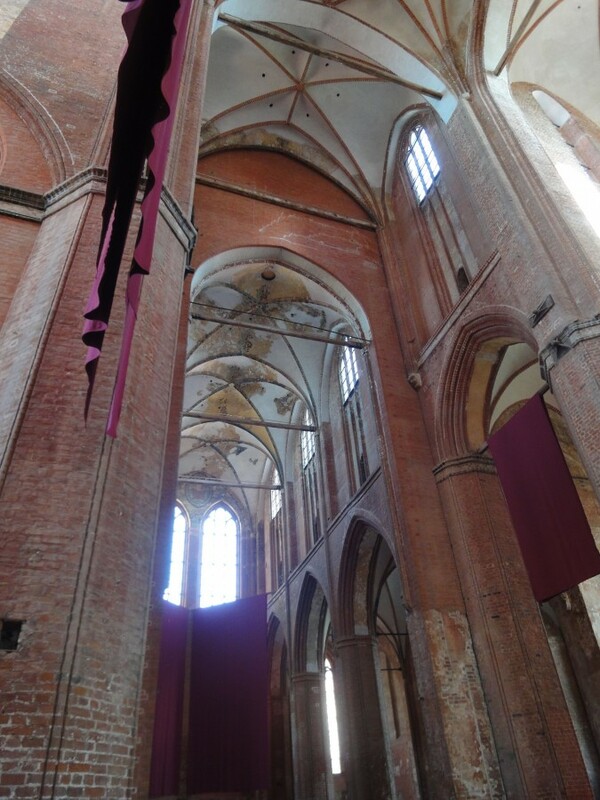 Especially fine is the partially-ruined red brick cathedral church, which is undergoing reconstruction. Great care is being taken to restore the building in medieval techniques, including hand making the bricks in their many special shapes. The inside has many bits of fresco and floor memorials, currently pushed against the walls. Most of these were for wealthy Hansa merchants and have a ship in full sail depicted on each. Doorways to nowhere, strange niches in the walls and holes for upper floor joists were visible and intriguing. 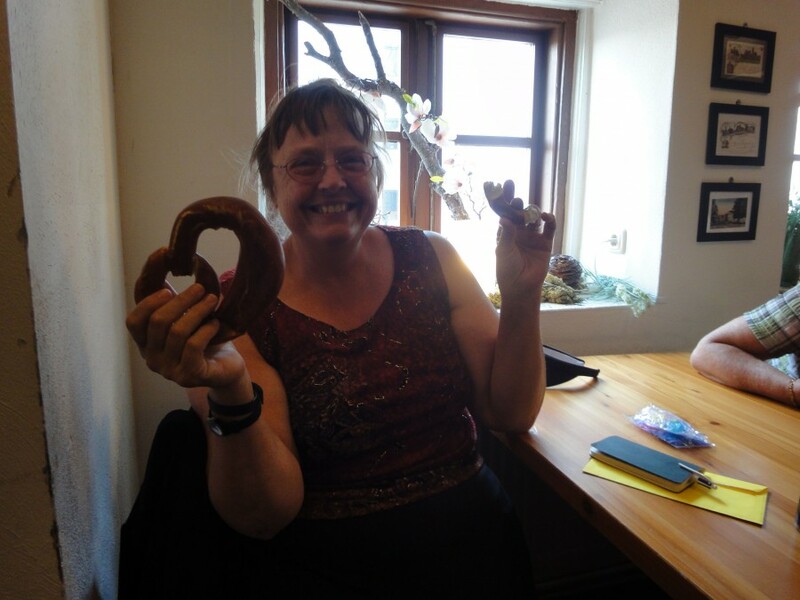 Then we went to Cousin Vinny’s beer hall [www.hinricusnoyte.de] where we had a “praytzel.” I have read that the origin of these delish bread treats is that children who repeated their catechism correctly were rewarded thus. The bends in the bread represent the crossed, praying arms of the child with the elbows stuck out, and the bowed head. In other words, the loops face downward. We also had 2 kinds of beer: dark Kräuter and pale Mumme. I thought the Kräuter tasted a lot like Pepsi and I drank mine and Ron’s. The Mumme tasted like Bud and he drank both of those. Vinny, aka Hinricus, has been brewmaster here since 1995. The building was built as a brewery in 1402, though it has not been a brewery through all the centuries. Back to the bus for a scenic drive through the gathering darkness, we spotted deer coming from hiding to watering holes. Thoroughly thrashed, we still went to dinner in the dining room, where we were seated with a couple from French Canada. She spoke little English and I little French, but we had an animated conversation non-the-less. When her twin sister arrived from the Berlin train, we excused ourselves and went to bed. And, just when you think you might expire from the feet up, Sea Day! We hung out in our room, Ron downloading photos and I playing a ‘hidden objects’ computer game on my el-cheapo tablet. The crew has told us that it had been raining everyday the last week, but we had gorgeous weather in the 70s with low humidity. We couldn’t talk ourselves into going to the hot tub. We took an after breakfast nap and an after lunch nap. All the while, our trusty ship bore us ever more northward. Footnotes. On all our trips, our feet are noted for great fatigue and blisters. 1.The Trough is the buffet on any ship where they offer food at all hours of the day and night. 2. Cousin Vinny is any relative who has a sideline, often involving kickbacks. Some Cousin Vinnys will drive you to the airport etc. Upscale Cousin Vinnys have specialty shops that the tour busses call into. These Cousin Vinny stores have bathrooms and sometimes free samples of their wares. 4. Foamer is usually used in connection with trains, and means one who loves locomotives and knows all about them personally, by name and number, and are foaming mad for trains in general. Ron and Carol like trains very much and love to ride them, but we are not foamers.